Virus and malware threats have grown exponentially and have become more deadly in the past few years. As Microsoft Windows OS has a large user base, malware and virus authors target Windows users. A virus may delete critical files from the system permanently. It may also corrupt the file or block users from signing into their user accounts. It wouldn’t be wrong to say that malicious programs are one of the major causes of the data loss in computers. Windows 10 is the most stable operating system introduced by Microsoft Corporation. The older versions of Microsoft OS i.e. Windows 8, Vista, XP have received mixed reviews because people have faced several issues while using the operating system. Users of these OS often encounter the deadly blue screen of death error. More importantly, the operating systems are not as secure as Win 10. If you’re using one of these OS, you must install and use a backup software to prevent loss of data caused by virus infections. Win 10 OS ships with a Windows Defender security software and it includes a powerful firewall to keep online threats and viruses at bay. Win 10 is a great OS. Before you update the OS or uninstall any program, you must backup the important files. To do so, you must use a backup software on Windows PC. Below, I’ve shared the best Windows backup software. FBackUp is a free backup software with an intuitive ribbon interface. It supports plugins and has a wizard utility to create backups. It allows you to share backed up files with devices connected to the same local area network. The software supports mirroring and compression. To compress a file, FBackUp employs the ZIP64 compression algorithm. The program lets users schedule backups. It supports encryption. FBackup allows users to backup files saved on external storage devices. It is a simple tool that enables you to sync the backups on Google Drive Cloud storage platform. The program can create a copy of an open file. It lets you define a task that the program must run after creating a backup. You can specify multiple backup paths with the free FBackUp program. The Cobian backup program has several interesting features. It creates backup files with .zip extension. Hence, you don’t have to use special software to check the contents of the backup. The Cobian program supports FTP protocol. Hence, you can move backup from your PC to a remote computer easily. Cobian comes with a logging utility. It can send the error logs to the inbox of an email address you specify. It enables you to encrypt and decrypt backup files. When you create a full, differential or incremental backup, Cobian Backup tool encrypts your data with the sophisticated AES algorithm. Like AOMEI software, this program supports Microsoft Volume Shadow Copy technology. It provides a powerful filter tool through which you can create backups containing files of specific extensions. PBS is one of the best freeware backup program. It provides a wizard tool for beginners. It allows experienced aka advanced users to configure backup tasks manually. PBS can save your backups to the local disk, a computer connected to the same computer or a remote FTP server. You can configure this program to compress the backup files, encrypt data and schedule the backup tasks. The Personal Backup software allows users to exclude directories. It enables you to create desktop shortcuts for the scheduled tasks. It includes an option to overwrite files in a backup. Comodo has launched plenty of free security software for Windows PC. It is a leading provider of SSL certificates. The Comodo backup software is as powerful as the other security software products launched by the company. Comodo Backup utility has a beautiful UI. It enables you to backup and restore partitions, master boot records, registry entries, and registry files. The software enables you to create backup DVD. It supports FTP and SMTP protocols. It comes with a calendar interface through which you can see the backups created on a specific date. The program allows you to create a rescue disk. It can run in the background of the Windows OS as a service. EaseUS is a great alternative to above programs. It offers 25+ features and has features that you’ll find in a premium/paid software. EaseUS makes users aware of the number of files a disk partition has. It can mount backup images. It has the option to securely delete old backups permanently from the PC. EaseUS Todo supports disk cloning. It can restore backups created on Windows PC onto a Linux OS powered machine. The software lets you create emergency disks. It can send small backups to the inbox of your Gmail or Outlook account. AOMEI is a powerful software that provides several features. It features a tabbed user interface that boasts options to create backups of various types. The software enables you to backup individual files, partitions, an entire disk, etc. It supports Microsoft VSS service and has intelligent sector feature, which makes sure that the order of disk sectors and data on it isn’t changed in the backup. AOMEI Backupper has the option to test the disk image. It allows you to create bootable media from the image. AOMEI offers a virtual disk tool through which you can mount the backup image file and see the contents of it. 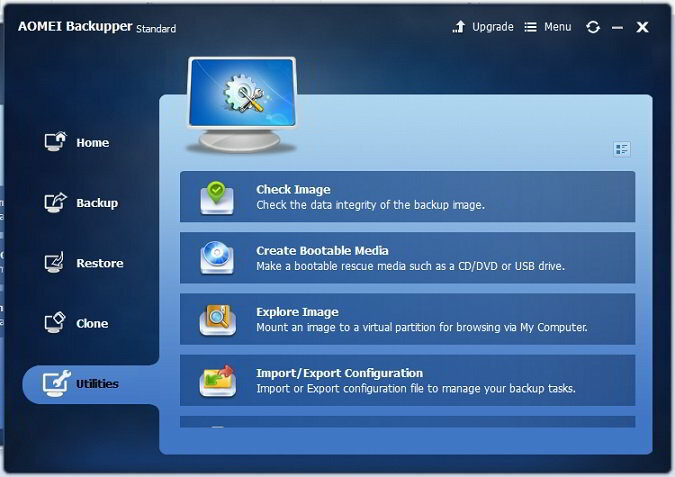 AOMEI Backuppper allows users to restore backup images with a single click. You can split large files into smaller chunks with it. Conclusion: I’ve used several free backup software on my Windows 10 laptop. Unfortunately, only six programs were worth to mention in this article. The software mentioned above have excellent features. They provide many tools for free. They run on Windows XP, 7, 8.1, 10, Vista, and 8 operating systems. You don’t have to register the software before using it.